Most people in the U.S. are familiar with at least the term, “The Lost Dutchman Mine”. The actual phrase “The Lost Dutchman” was coined by Sims Ely in 1953. The story has been told and retold countless times in countless versions. The legend began here with this newspaper article on January 13, 1895 by P.C. Bicknell in the San Francisco Chronicle. Bicknell article. This started it all. In the article, Bicknell describes a “District” and the connection to the Peraltas. In 1895 there was no other kind of District besides a “Mining District”. The Lost Dutchman subject will not be expanded here. However, there is one piece of the Dutchman story that stands out, and that is of the Peralta family, and the Peralta mines. In fact, the Lost Dutchman story begins with a Peralta in the article above, and in just about any other version. 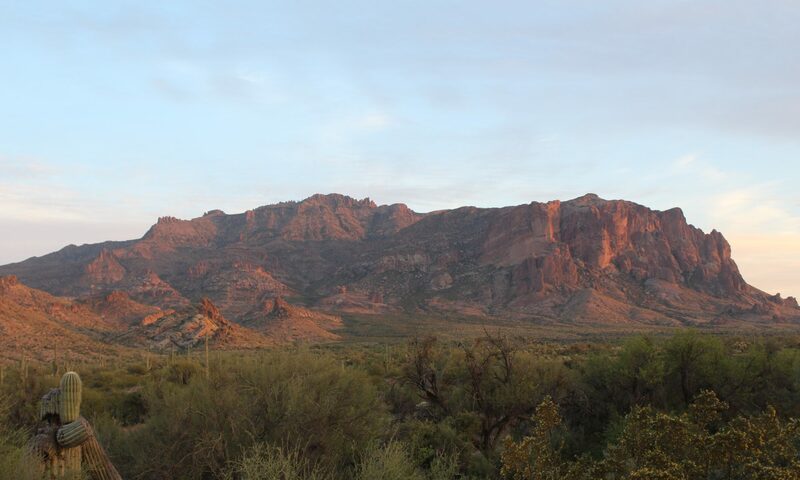 The legend that is told is that a Peralta-led party of about 400 people were slaughtered on the north side of Superstition mountain in the spring of 1848. 5000 U.S. Marines had entered Mexico City in September of 1847, and the war ended February 2, 1848. The story that is told is that the Peralta Party hid the mines before being slaughtered as they were packed up and ready to return to Mexico. Since Jacob Waltz passed in 1891, a plethora of stories, maps, and “findings” came out of the woodwork, many of them directly from Mexico. There is one BIG problem with all of this information….. most of it has no geologic basis, except for some attempts to connect the mines to Goldfield or some diggings on the eastern side of the Superstition wilderness. Without the geologic evidence indicating a great deposit and a mining district, the most important feature being the alteration of the surrounding rock, there can be no mines. Many historians have known that the Peralta mines were a “big deal”, and they have been called the greatest mystery of the western U.S.. How could an entire mining district just disappear? The discovery of the mines by the author began on a “whim”. A mining claim was staked by the author on a barren quartz outcrop near First Water Road just for the sake of being able to say “I staked a mining claim”. A few more adjacent claims were staked over the next few months as a sneaking suspicion developed that there was something really big in the area because of the mineralization, alteration, etc. The controversial “Peralta Stone Maps” were read about on the net, and on a notion, a picture of the “Trail Stone” was brought out to an area north of the claims where some striking natural landmarks were observed. These landmarks matched the stone map with surveyed accuracy, and directed the map viewer to 2 short ridges (and a filled-in pit it is known now) that were at the time on unclaimed ground. It was reasoned that it was statistically impossible that the match could be by coincidence. After great debate, knowing almost nothing about the geology, the ridges and more were staked. Regardless of feeling foolish on more than one occasion, the research continued. During more than a decade of hobbyist research, the geology fell into place piece by piece and the physical evidence mounted. As the geologic model and physical evidence was revealed, the maps and stories that have appeared during more than a century could be separated like wheat from chaff. The mining district slowly revealed itself, out in the open, at the foot of the Superstition Mountains, with “El Sombrero” in full view, just like the Spanish and Mexican stories told. Incredibly, the 2 ridges were indeed found to contain ore, a type that no one suspected; Volcanogenic Massive Sulfides. 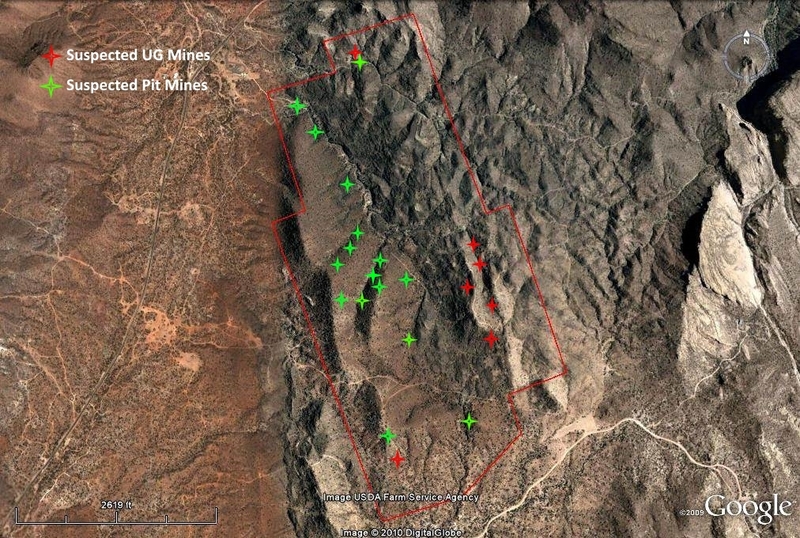 Below is a Google Earth photo of where the suspected mines are located (so far). It is very ironic that one is located about 100 feet from the bench at the end of sidewalk at the Needle Overlook. 1. 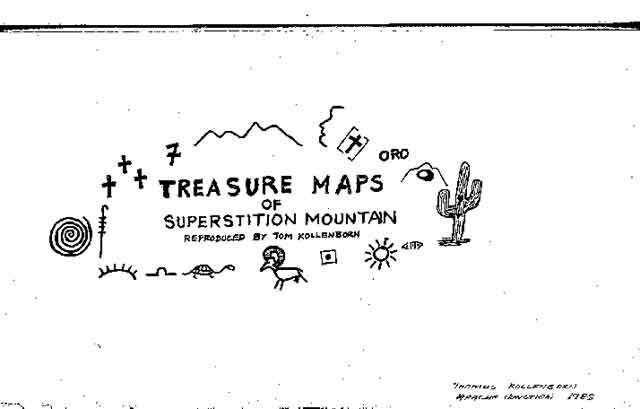 The Treasure Maps of Superstition Mountain by Tom Kollenborn. Mr. Kollenborn assembled all the maps that were known in 1985 into one package. The Spanish and Mexican maps shown within all came from this collection. The maps were redrawn by Tom so that they could be more easily seen. The first printing of this book was in 1953. Mr. Ely wrote this book when he was 90 years old. It recounts the efforts of Sims and his partner, Jim Bark in finding the lost mines. Sims coined the phrase “The Lost Dutchman”. The book is the gathering of all of the stories and tales circulating at the close of the 19th century. Sims and Jim Bark found some physical evidence that still remained, including 40 acres of logged-off mesquite trees. Bark was an acquaintance of Jacob Waltz. In this book, Dr. Thomas Glover unveils the evidence he found concerning the famed Peraltas and their massacre. He did this by genealogic research and interviews with descendants of the Peralta mining family. Many, if not most of the most famous stories are also presented here, and facets of some that have not been printed before. Dr. Glover presents the almost forgotten “Salazar Survey” here, and for that, this author is eternally grateful. Several more stories are presented here that relate to the location of the Peralta Mines presented on this website. During the past 14 years, more than enough evidence has been found by the author to reach the conclusion that the Molly Marie Prospect is the site of the Peralta Mines. The following pages present the most convincing evidence, and there is much more. This article is about a visit from Cristobal Peralta 0f Spain in 1924 to see the mines that his ancestors had worked. Unknowingly, he showed his American guide the bearings to 2 landmarks that gave the precise location of the mine. At the time the article was written, it was thought that the bearings were to a hill dubbed “Cerro Negra” by the author that is a VMS deposit, but a year later was found to be the bearings of the actual “cave zone” of a very large underground mine next to Cerro Negra. This mine is described further in the “Great Mine” article. These maps are controversial to some, and with a simple interpretation the Trail Stone Map gives the exact location of the arkose breccia ridges that contain many filled-in pits mined by the Peraltas or possibly earlier. This was substantiated by the seismic testing of several of the suspected pits and by core drilling on their perimeters. All of these filled-in pits are surrounded by black chlorite alteration, found exclusively at VMS deposits. The heart of this article is the Minas del Oro map, and it led to physical evidence that proves the location of the main milling area of the ore. The mill site is in First Water Canyon, less than one mile from the “Great Mine”. Cart ruts were found that told of the passing of countless ox-carts loaded with ore. Soon afterward, mercury vapor testing in First Water Canyon revealed mercury levels as high as one of the most mercury-polluted places on earth….. the Potosi district of Bolivia. The Minas del Oro map shows the “fold” in the basalt as its centerpiece, which contains at least 3 large VMS deposits, including Cerro Negra which is the site of the Great Mine. This article is about the Coronado expedition and suspicious events that happened before the expedition began. It presents evidence of possible pre-Columbian mining in the Goldfield Area. The Burbridge Map is presented in this article that is likely the tunnel complex that was driven to explore Cerro Negra, and clearly shows evidence of the remains at that time of the Meso-American trail system. This article ties one of the most revered maps of the LDM-Peralta Mines searchers, the Peralta-Fish map, to a very large maar diatreme. After the evidence is presented, it is clear that that the map clearly depicts the same maar and its gossan rings which be seen on Google Earth. The location of several more mines is indicated on the same “fold” in the basalt shown on the Minas del Oro map. An article in the Phoenix Herald and Republican in 1893 described a “Great Mine” that had been found 5 years earlier north of the west end of Superstition Mountain. Approximately one year after the “Salazar Survey” discovery was made by the author that gave the exact location of Cerro Negra in relation to natural landmarks, the “Great Mine” was discovered by accident while using Google Earth. The Great Mine was found to be a distinct cave zone of a very large mine, on the eastern side of Cerro Negra. The irony is that the author put a center post for a mining claim in the center of the cave zone 12 years earlier because of the outstanding mineralization found there.